In addition to cutting-edge equipment and pioneering techniques, we’re firm believers in the holistic approach to dentistry. We don’t just target a single problem head on with a one-size-fits-all solution, instead we look at the wider picture along with our patients, investigating all aspects of dental health to fully determine what the issue might be that’s causing them pain, discomfort and embarrassment. The teeth, gums and oral tissues aren’t just crucial for healthy eating and aesthetic reasons, they’re an indicator of other problems within the body. By taking a holistic approach, we can provide you with a long-lasting solution and can also identify deeper health concerns that might need addressing. Although dental professionals have deemed mercury amalgam fillings to be safe, many patients report several side effects and health implications after having mercury fillings installed into cavities. Many patients report feelings of tiredness and fatigue, general uneasiness and a foggy head that they often relate to mercury fillings. That is why at The Berkeley Clinic, we provide safe amalgam removal. This is one area where our holistic approach really comes into its own and our experts will work closely with you to discuss your symptoms, case history and concerns to provide you with a treatment plan that works for you. Mercury is an incredibly toxic metal. Like other heavy metals like lead, mercury can be harmful to your health and can cause severe cases of poisoning when it leeches into the body. Mercury can also cause adverse allergic reactions. Between 1-5% of the population exhibits allergic reactions to mercury, meaning a large proportion of dental patients cannot accommodate mercury amalgam fillings at all and should be seeking alternatives. What’s more, mercury can trigger auto-immune responses in the body, a potentially devastating condition which can turn something as simple as a cavity into a life-threatening risk. 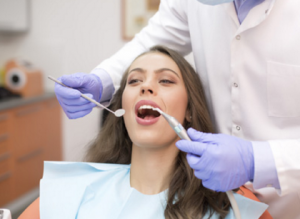 Our techniques for amalgam removal are not only safe, but quick, leaving you with first-rate results without the hassle. We provide clean air supply and then commence high-speed mercury vapour evacuation. Sealed mercury proof rubber dams are used to ensure that exposure is kept to a minimum, while same day ceramic reconstructions are available to provide you with the replacement you need in no time at all. You can read more about safe amalgam removal in our brochure. 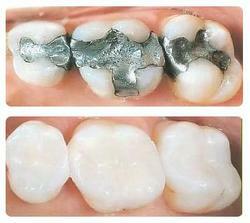 Mercury amalgam fillings were originally used in dentistry because they were relatively inexpensive and easy to fit. Today, these types of fillings are still commonly used for the same reasons. However, they are a poor choice when it comes to bio-compatibility and there are several other options which are much more effective. Ceramic inlays are a particularly desirable alternative, with cast models made from computer imaging. This alternative isn’t just a more attractive alternative because it is free from harmful chemicals, it can also restore a tooth after a filling is removed, leaving patients with a healthier, more natural looking smile. Composite resin fillings are another choice for patients, but like mercury amalgam fillings, these aren’t bio compatible and don’t last as long as ceramic alternatives. Dr Stewart Wright has grown an international reputation for his holistic approach to treating patients. The Berkeley Clinic have never placed mercury amalgam fillings. When patients come to us looking for help filling cavities or replacing old ones, we’ll always provide a metal free alternative that leaves patients with a healthier mouth and total peace of mind. What’s more, we pride ourselves on utilising the latest technologies, techniques and after-care processes to ensure every patient is left with the best possible result, every time. Are you looking for a holistic dentist in Glasgow or would you like to find out more about Safe Amalgam Removal? Get in touch today to arrange a consultation. Call us on: 0141 564 1900, email us on: reception@berkeleyclinic.com, or get in touch via the online enquiry form. This entry was posted on Friday, April 28th, 2017 at 2:20 pm	and is filed under Dental Health, Dental Treatments. You can follow any responses to this entry through the RSS 2.0 feed. Both comments and pings are currently closed.